We exhibit original prints by both member artists and invited printmakers. contains over 500 prints by our member artists. It is curated annually and is available for viewing by appointment. Many gallery and museum exhibitions have been curated from our Flat File. Prints in the Flat File are available for loan and are for sale. Our rotating digital exhibitions showcase curated selections of members’ prints from the Flat File. The prints in these exhibitions are available for loan and/or sale. 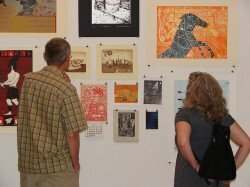 Zea Mays Printmaking members’ work featured with an individual web page. We have published three exquisite portfolios of prints to date which are in various prestigious collections – view them online here. Short videos of several of our faculty artists demonstrating and discussing their creative process.